Fuzzy, our charcoal gray semi-Persian has been the resident cat for eight years, which seems a long time indeed when one ponders the trouble and anxiety he brought to our lives. It was because of him that we had to construct partitioning doors so he couldn’t get to our good furniture and pee on it. No way could we have artsy floor rugs to prettify our place, as he would promptly pee on them too. A LOT would be the number of things we have had to throw away because of this. But he has a cute face, so we dealt with it instead of throwing him out too. I realized early on that he was the proverbial scaredy cat, frightened by sudden noises, shy around visitors. You could forget that he even existed, given that he spent long hours sleeping/hiding under the bed, only to emerge for food and his precious water. When he began to display an unusual interest in a certain ugly tomcat that taunted him from the balcony door , I began to think (twisted logic, I know) perhaps Fuzzy would like some feline company in the house. 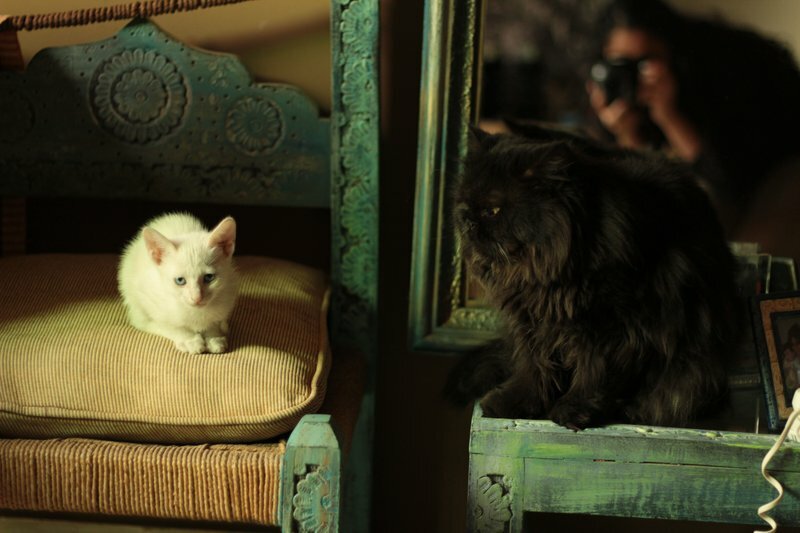 When little billi joined him once too often on his bed, Fuzzy stopped sleeping there altogether. I should have known better than to give them food at the same time too. Little billi was a voracious eater and ate hungrily and greedily, even taking over Fuzzy’s bowl forcing him to back away slowly and be patient until she was done. It was hilarious to hear her grrs as she attacked her food bowl. 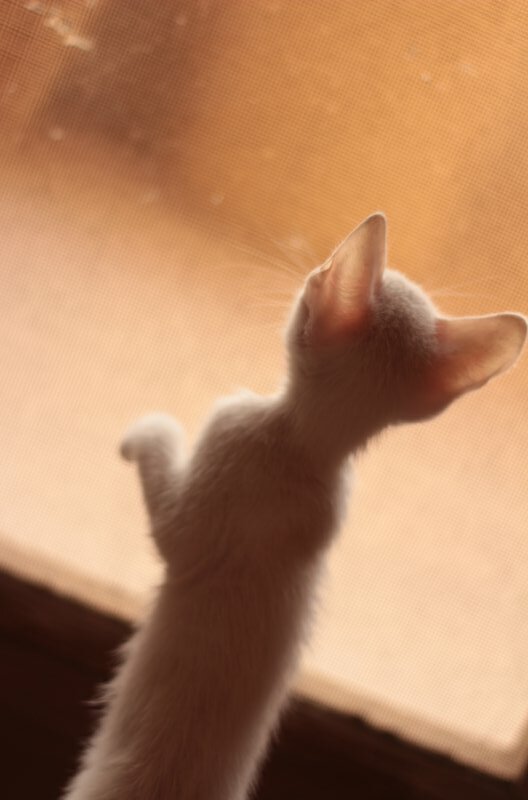 She was tiny, but she already had the large personality and attitude of a street cat. Little billi morphed into demon-kitty for the way she ambushed and attacked, biting and swatting anything that moved. Her appetite for play was insatiable, and for the first few weeks all we did was watch her and play with her and delight in her presence. Her favourite game was scrunched-up-newspaper-football. 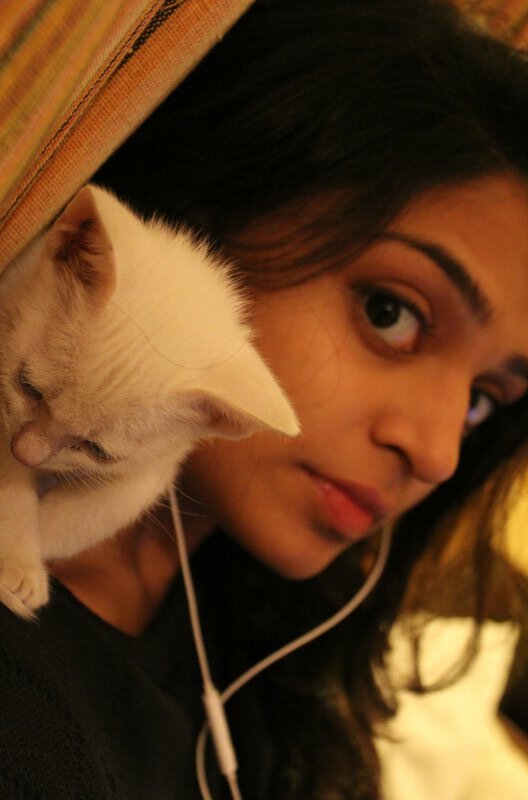 It seemed what we had on our hands was the most playful kitten in the world, lighting up our lives with her craziness. 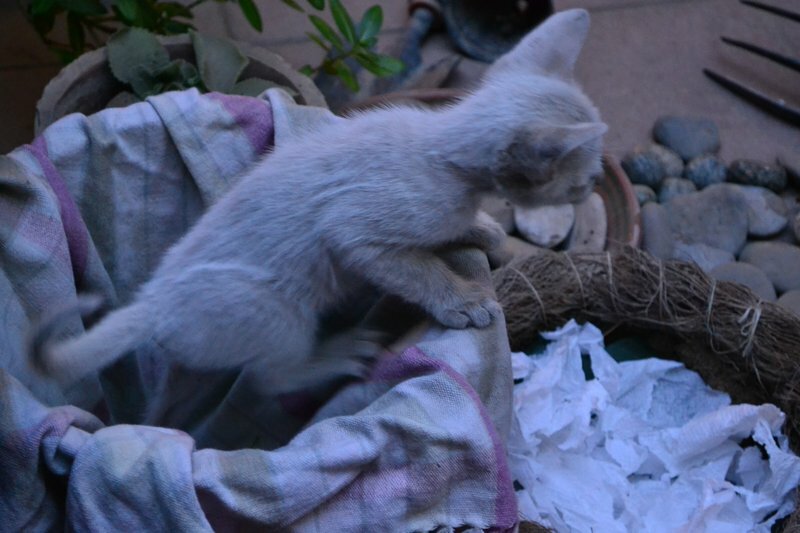 What was most amazing and joyous however was the fastidiousness with which she took to her litter box. She knew exactly where to go from day one. I was in love. She liked sleeping snuggled with Amu, and Amu loved her snuggliness too. 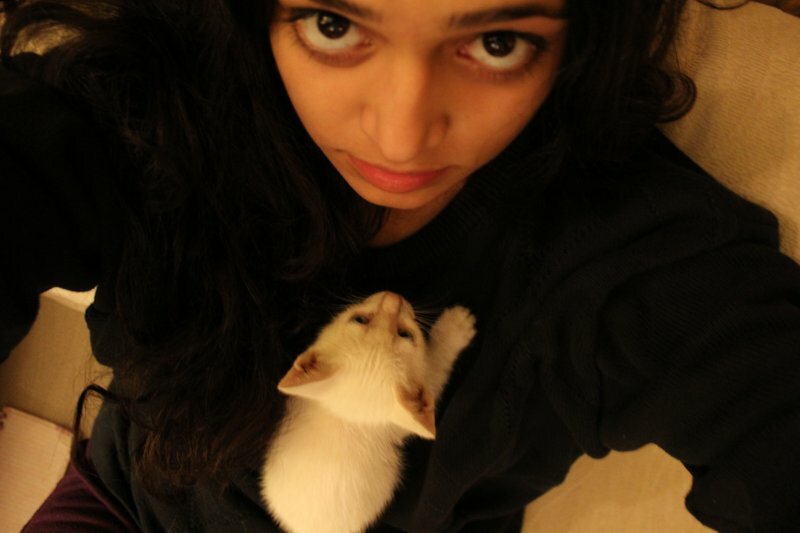 She was going through a rough time in school and it was comforting to have such a kitten-like kitten to come home to. She kept her company while she worked on assignments at her desk, either curled on her lap or shoulder, or just hanging around watching her write, swatting her hand occasionally or trying to chomp on her pen. But as Amu’s cloud of school-related gloom lifted, an altogether different cloud seemed to have descended elsewhere. Fuzzy’s behavioural issues were beginning to enter new territory. If we had been dogged by his peeing and marking before, we now suddenly had to add spraying to his repertoire of activities, something he had never done before. Now, he started to back up against a variety of vertical surfaces, quiver his furry tail, and let loose a jet of particularly foul-smelling piss. Up till now, we could handle his daily misdemeanours near the windows and doors. What was horrifying was when I realized he had begun to mark us. I found a patch of piss on my side of the bed one day. The very same day he peed on the bathroom mat as well. He also peed on my favourite chappals. Also Huz’s. He sprayed my bedroom door. He peed under my dresser. He sprayed my chest of drawers. He sprayed the bass speaker on my table. He wandered into my room one day and sprayed the curtains, all things he had never done before. Little billi/demon-kitty became my official pee detector, sniffing out places when I couldn’t figure out where the odour was wafting from. AlI these things led to Huz becoming firmer in his resolve to convince me that two cats in one house cannot possibly stay. As for me, I was mostly to be found with a bottle of pet deodoriser in one hand and a bucket of water and a mop in the other. Demon kitty was unabashed in her exploration of furniture and bounded onto tables and counters with a casualness, agility and will which had never manifested in Fuzzy. But seeing her boldness, Fuzzy seemed to gain heart. He probably began to think that if she could do it, so could he. The final straw for me was when we realized Fuzzy had perched on the back of a chair and proceeded to empty his bladder. I didn’t really understand what I was dealing with were the signs of a very stressed cat. All he was doing of course was responding to perceived threats. His entire body language had changed and why wouldn’t it? He was being ambushed every day by demon kitty, his food was being gobbled by her, she was drinking from HIS WATER BOWL, his bed had been taken over, she was using HIS litter to do some extremely smelly poop in. 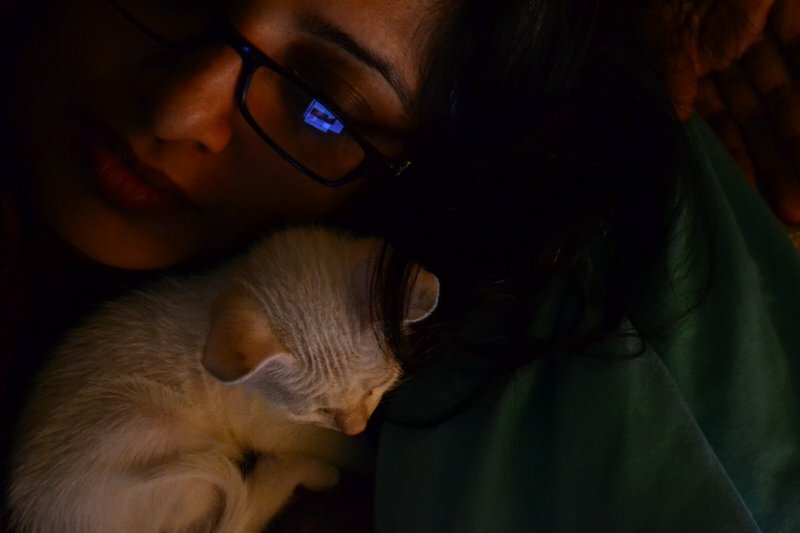 I was guilty of ignoring all these things, expecting him to take it in stride while I was busy catering to the kitten’s needs.. His world had suddenly become unpredictable and chaotic. He was forced into persistent contact with another feline against his will. Of course this couldn’t go on! Fuzzy took to staying awake all night, keeping up an unbearably mournful dirge which woke me up from my sleep every couple of hours during the night. I was getting dark circles under my eyes and I couldn’t function like a normal human being anymore. You could safely say I was pretty stressed out myself. 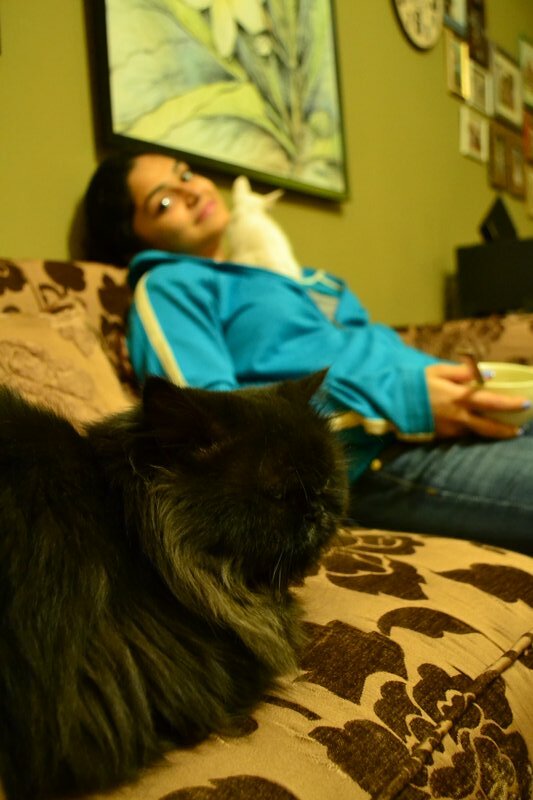 I asked around for advice and all I heard was to keep the two cats apart….I had no idea how to accomplish this. But we had been dealing with Fuzzy’s peeing problems since way before the new kitty ever came along to exacerbate it. He was already neutered…what more could we do?? 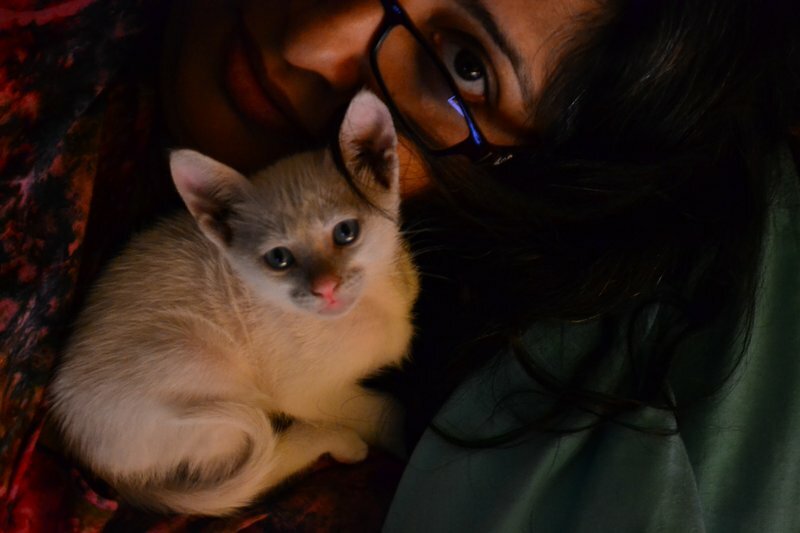 PAWS advised me to go to Dr Isma, the more upmarket vet in Karachi, for a consultation. I packed a very smelly Fuzzy into a basket and off we went. Dr Isma was lovely. Just seeing the sympathetic expression on her face as she listened to my cat story was balm for my frazzled nerves. She pronounced Fuzzy to be an extremely stressed out cat indeed and there were only three options she could think of to deal with this unfortunate event: 1. To inject Fuzzy with female hormones. 2. To get a calming spray, like Feliway. 3. To administer an anti-depressant on a daily basis. The first two options being overlooked perhaps due to unavailability or being expensive, Dr Isma recommended a quarter pill of an antidepressant called Clomfranil. We bought a few strips of these from a pharmacy on our way home, 20 rupees ($0.2) for a strip. Maybe I’d pop one or two myself. That evening, I cut one pill into four uneven pieces and stuck the largest one into a piece of cat food. Fuzzy ate it. From a worried-looking anxious cat that paced relentlessly around the living room, I found him a little while later, stretched out languorously near the balcony door. There was no distressed yowling outside my bedroom door that night, and all the sheets of newspaper that we spread in all his usual spots were piss-free the next morning. The house didn’t smell foul, and Fuzzy was fast asleep peacefully on his wicker bench. My brain did a whoop of joy! My problems were solved! 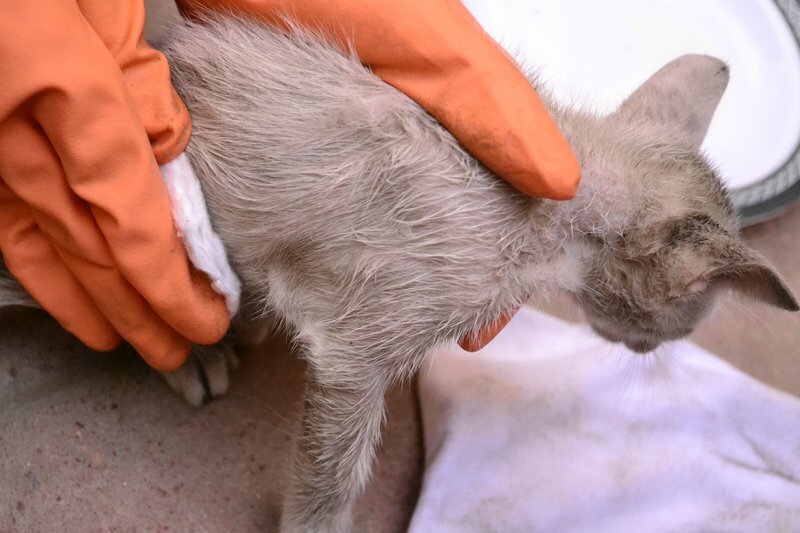 After a warm meal of diluted milk with a spot of honey, little lost kitty received a nice rub-down with cotton wool soaked in Frontline spray and a clean cloth to get as much grease off as possible. I could tell she didn’t like the smell of the flea medicine, nor the feel of being wet, but she took it like a sport. Amu and I spent all day checking up on her and watching as she ran around and explored, dying fleas hopping off one by one. That night she spent outside, but safe and away from cold draughts in a big empty litter bag. 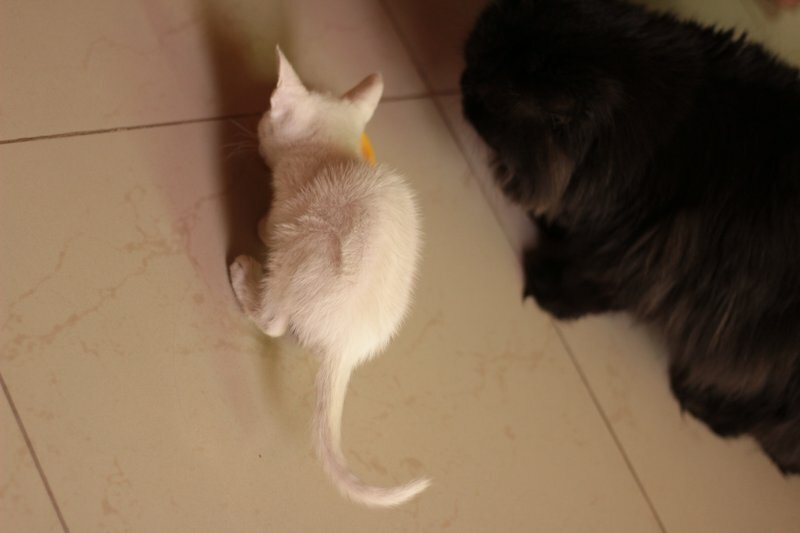 The maternal instinct had already kicked in as Amu and I worried about the little kitty all night. 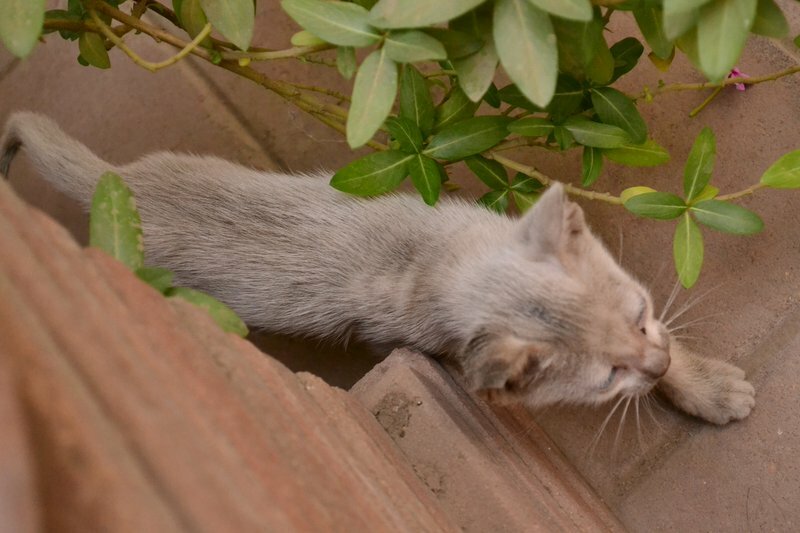 Needless to say, we had already asked the chowkidar to keep an eye out for a motherly looking cat with babies. He said this one seemed most likely to have wandered into the parking lot from somewhere outside, though there have been a few cat births on the roof in the past. 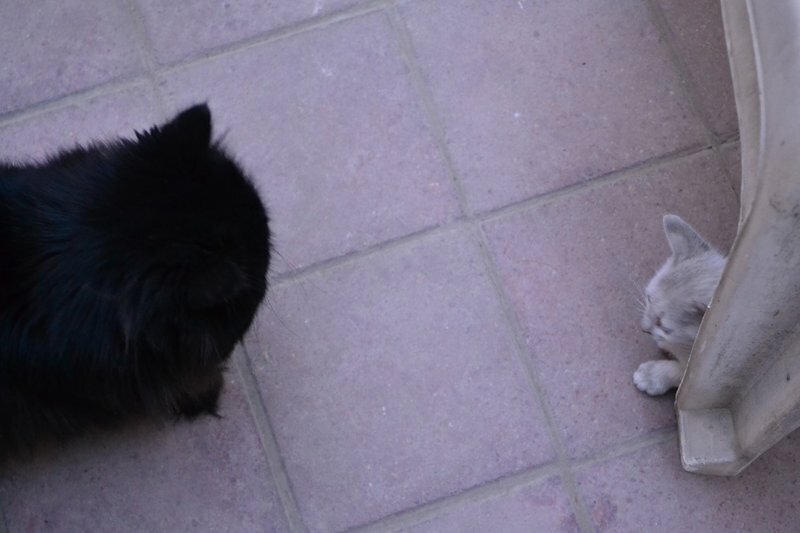 The next day, and not without a little trepidation, we let Fuzzy (the resident cat) meet the newcomer. 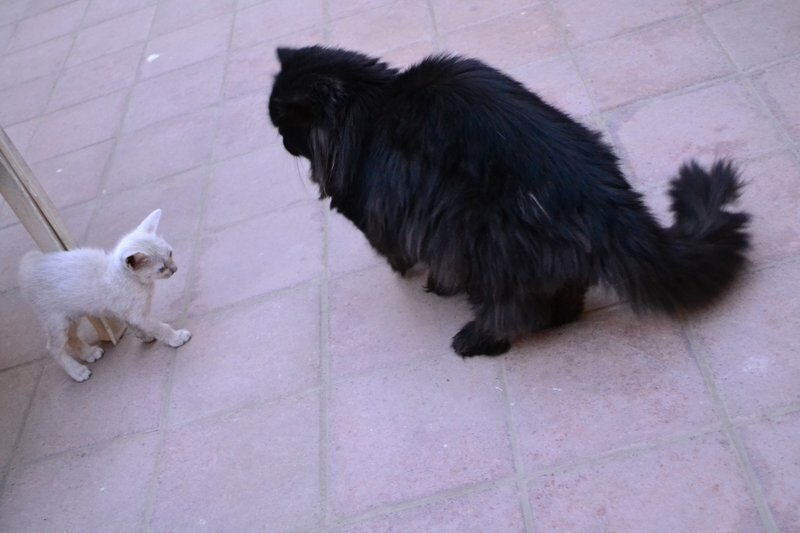 We stood alert, and though Fuzzy wasn’t as relaxed around her as we would have liked, nothing untoward happened. I began to get visions of a multiple cat household. A simple thing like waking up unusually early one day can change your life forever, or at least for the life span of a cat. Here’s what happened one beautifully crisp morning in December. Decided to take Amu driving at 7am as the stretch of road where I teach her is relatively car-free and less intimidating then. In the parking area of our apartment building rang out the forlornly incessant mewing of a decidedly small cat. The mysterious mewing kitty was hiding in the space between the top of the wheel and the chassis of our car, rendering us incapable of driving away without getting it out first. Seeing us standing around helpless, the chowkidar fetched a stick to get the invisible noisemaker to jump off and run out. What emerged was a tiny grease-covered creature of indeterminate colour and scared blue eyes. 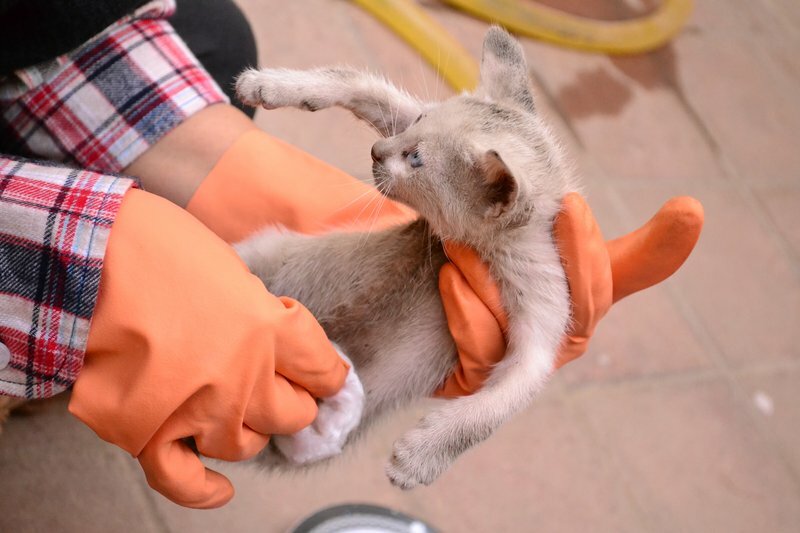 I picked her up to stop her from running under the car again, and after ten minutes of confused debate decided to put her in our courtyard for the time being to keep her safe. 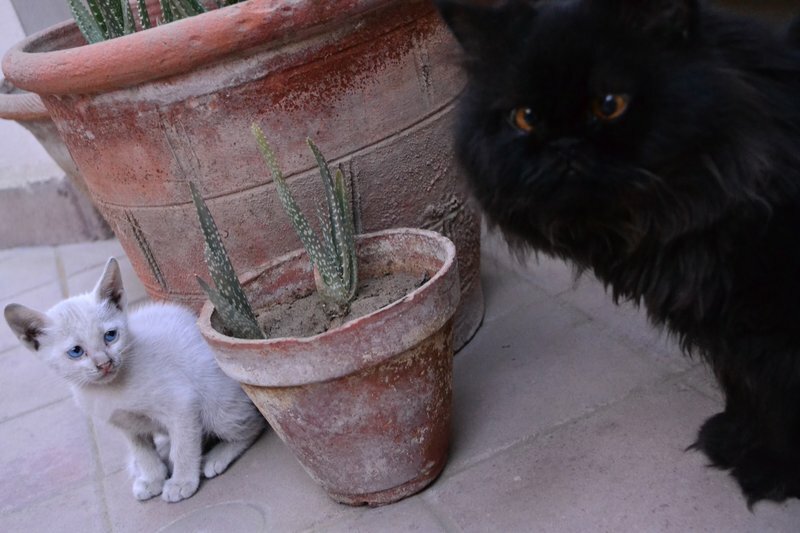 When we returned from our driving session, the tiny kitten was quietly curled up behind one of the potted plants, but ran out and started mewing again when she saw us. 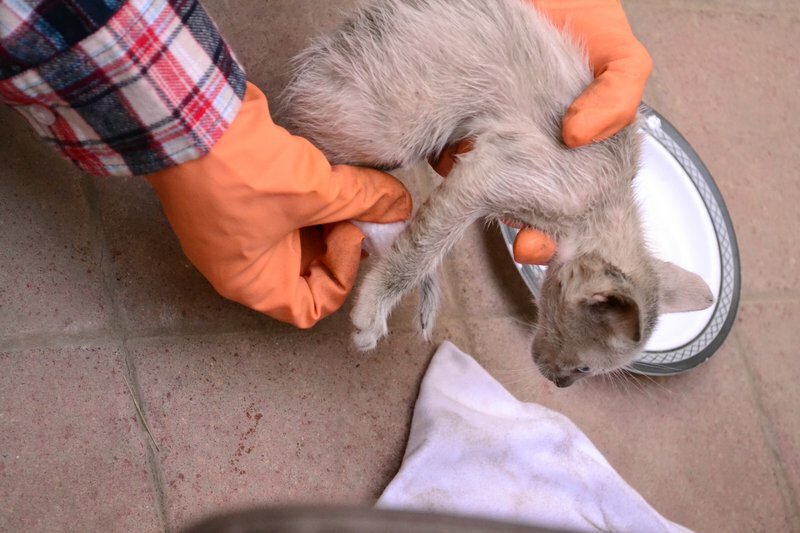 She was obviously hungry and cold and infested with fleas, and there was no choice but to clean her up and feed her and keep her warm…. So I’m sitting at my table, it’s early morning (earlier than usual for me, since I am NOT a morning person) and I’ve just had a couple of pan-toasted chapatis and a mug of sweet tea for breakfast. It’s a bit chilly, after the surprise rain we received in Karachi during the last couple of days, so I fetch my snuggly old hoodie and proceed to comfortably peruse my blogs and do some moves on Scrabble before getting on with my list of chores for the day. I’m distracted by a familiar scratchy, gravelly sound outside the study door, and I smile, knowing what this means. No, it doesn’t mean Freddy Kruger is around. It means Fuzzy the cat is being a good boy and using his litter tray. You’d think that’s only natural, right? Cats are SUPPOSED to ‘powder their noses’ in their designated space. Wrong. 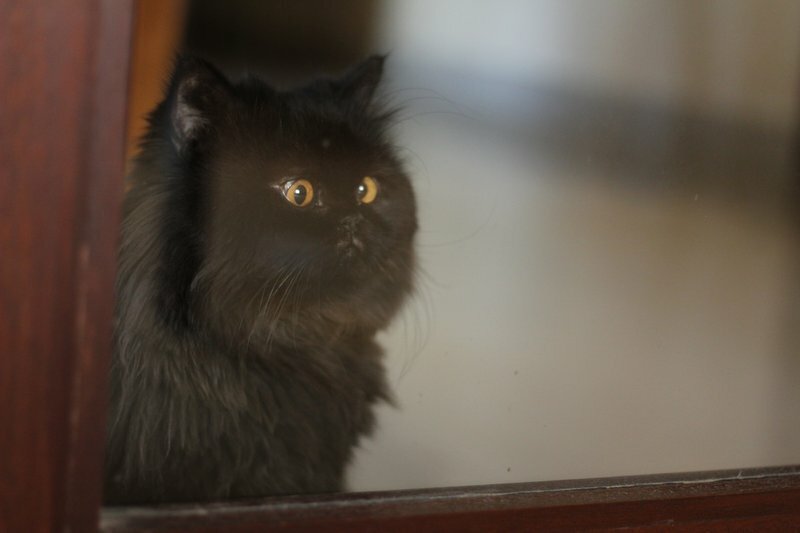 Sometimes a fuzzy black half-Persian tomcat decides he wants to break the rules. Exactly four years ago, Amu stamped her little foot (not really, but it sounds cute) and demanded a pet cat. I tried to reason her out of it of course. Having a pet is a huge responsibility (and I would know, since I have a looooong history with pets) and knowing Amu, I had a feeling she wouldn’t have the patience or the time to look after it. I humored her though, and after a week or two of daily pleading, I spread open the Sunday ad section of the newspaper and pored over the pet column, with Amu sitting next to me. 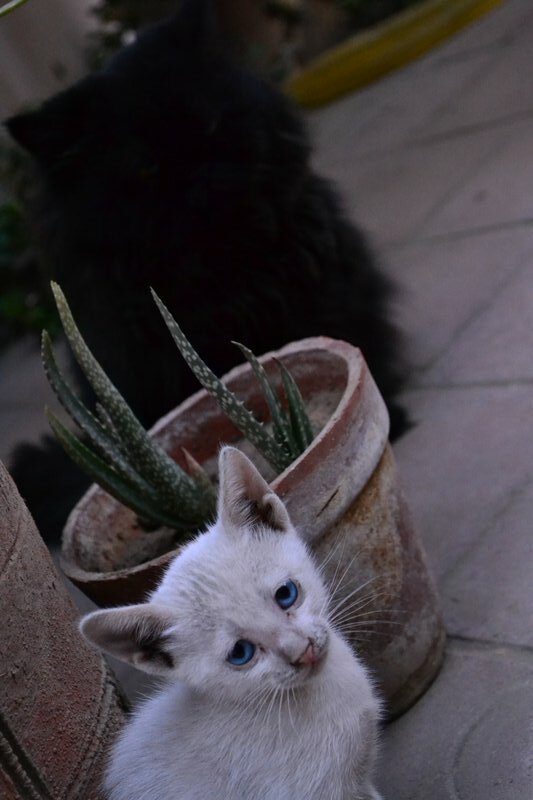 It turned out there were quite a few kittens for sale! 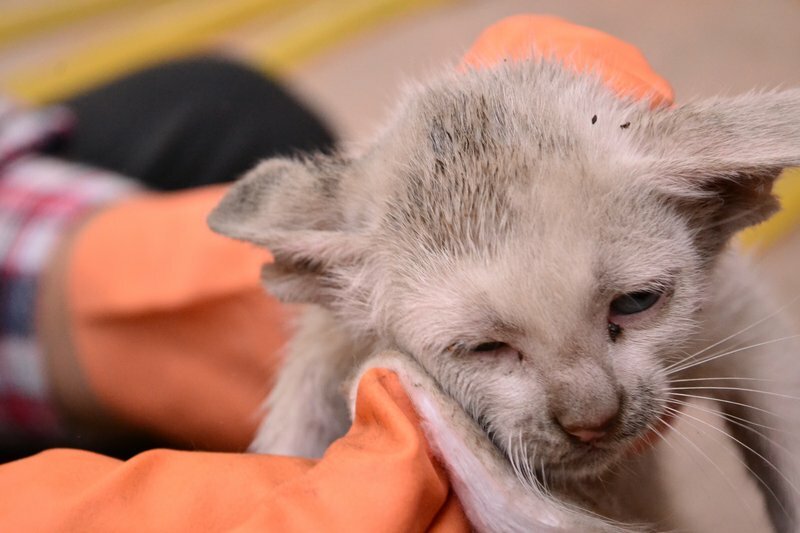 We jotted down a number and made a phone call to get the whereabouts of a semi-Persian pair of kittens. Amu nagged and nagged until we got in the car and drove off to look for the house of the gentleman selling the little felines. Finding the place was an adventure in itself, but as we parked outside the house and rang the bell, Amu and I wondered what we’d find. Someone came up to open the gate, and a youngish boy with greasy hair greeted us and ushered us into his garden. We walked over to the patio and saw the most adorable sight! 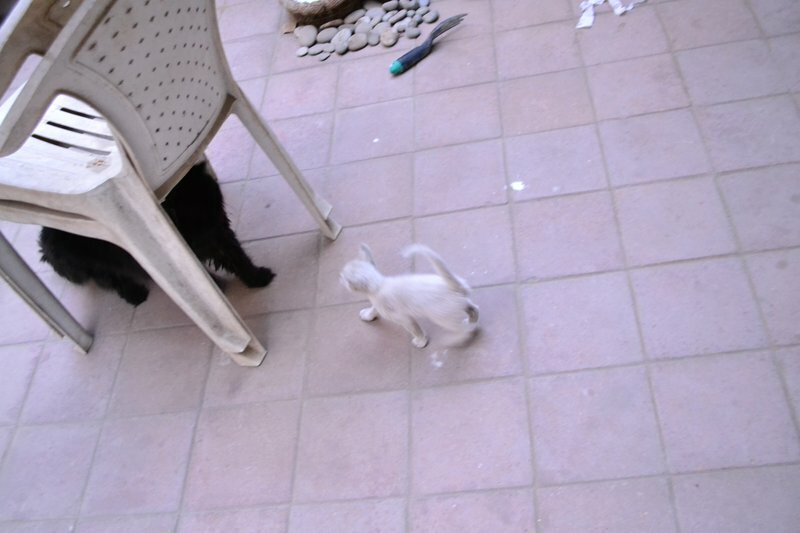 Two tiny little gray furballs hurtling after a ping pong ball and swatting it back and forth with their little paws! Amu and I just looked at each other. If she has an ounce of my genes, (and I think she does), we both felt the same thing. A mix of heart-melting delight and longing was shining in Amu’s eyes, and I knew she was in love with the first scruffy little kittens she encountered on her quest. As Amu clung to my arm and mouthed silent pleas, I asked the youngish boy how much he was asking for one of them. He quoted a sum about three times what I had in mind, so I told him we would go home and have a think and get back to him later in the day. Back home, Huz and I had a pow-wow. I thought the guy was asking for too much money and it wasn’t worth it. Amu was blinded by love and couldn’t think straight, of course. Huz warned us of the consequences of having a pet cat. What if it wasn’t potty-trained? What if we wanted to go on a holiday, who would care for it? What if it demanded too much time and commitment? Who would take it to the vet? These, and many other questions were debated, but Amu stuck to her guns and assured us she would love it and care for it and we wouldn’t have to worry about a thing. And then she threw in the trump card. She was lonely. That did it. So, against our better judgment, we went back to the greasy boys house, handed him a wad of cash in exchange for Sam, the tinier of the two siblings, feeling guilty for taking him away from his sister and playmate forever. It was evening as we drove home with a new addition to our little family, and we stopped on the way to buy some things that we had never bought before. Cat food! And cat shampoo! It felt like the gateway to a new world of groceries and products had just opened up for us, and it was kind of cute and amusing to be buying things called Whiskas, or Me-O, or cat litter that came in kilograms, in a sunny yellow bag that said Thomas. 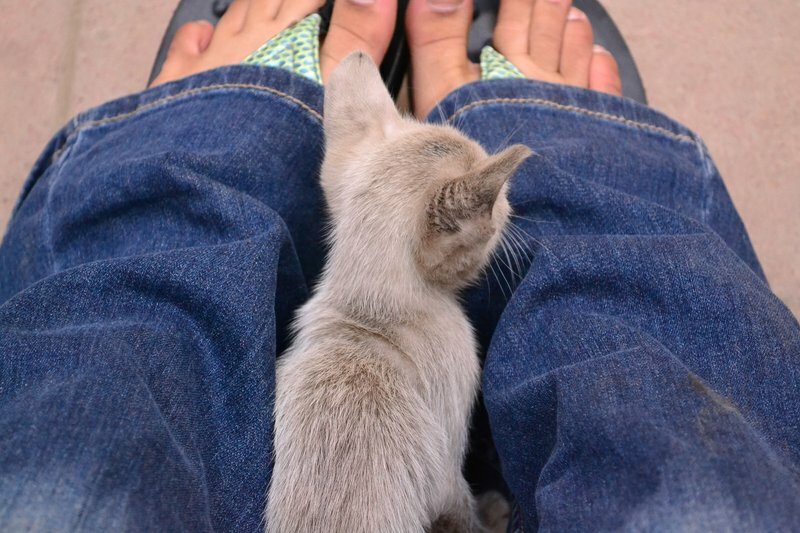 The tiny kitty perched on my knee during the ride home, while Amu leaned over the seat to pet him. He seemed quite comfortable with us, and didn’t seem scared or bewildered by the suddenness of this strange new experience. Back home, we let him roam around and explore the house and entertained him with things that normally delight kittens. We thought of giving him a new name, since he now had a new life. I can’t remember now if we re-christened him that night or the next day. I was stuck on Prince Rustam for some reason, but Amu decided on Fuzzy. We all approved, and hence, it stuck. That first night we made him as comfortable as we could, and made him a bed out of a cardboard box lined with newspaper. We wondered if his mom had taught him anything, and imagine our surprise when we witnessed the first bit of evidence that he had been rightly and properly schooled in the way of cats! Out of all the places he could have chosen to relieve his tiny little bladder, he picked a spot on some newspapers we had left lying in a corner for just that purpose. Oh, what a relief! Now I wouldn’t have to worry about learning how to be a mommy cat! Little Sam/Fuzzy knew his business, and by the time we got him a proper litter tray, he took to that immediately as well. We couldn’t sleep very well that first night, Amu and I, as we were worried about Fuzzy being alone outside in the living room. So we ended up staying awake till 5 in the morning, keeping an eye on the little thing as he prowled around, and once again I thought to myself ‘what have I let myself in for’. One does tend to get anxiety attacks when one is sleep-deprived. But after a week or so, we all settled down to happily co-exist, man and beast. It seems the little beast got a bit too comfortable sometimes, and there were ‘episodes’ where he was too ‘lazy’ to walk all the way over to his litter to relieve himself. Cat piss is a nasty, nasty business involving odours that are very hard to get rid of and have a propensity to linger, as I discovered to my horror. I had a penchant for having a clean house that smelled fresh and lovely, like washed laundry, so imagine my shock at realising how little control i had over my cat’s bladder! He merrily proceeded to pee at least once a day on something he really shouldn’t. Like the sofas. The rugs. The bean-bag. The comforter. The floor. The newly-installed carpet in Amu’s room. The bathroom mats. You get the picture. The cat was out of control! 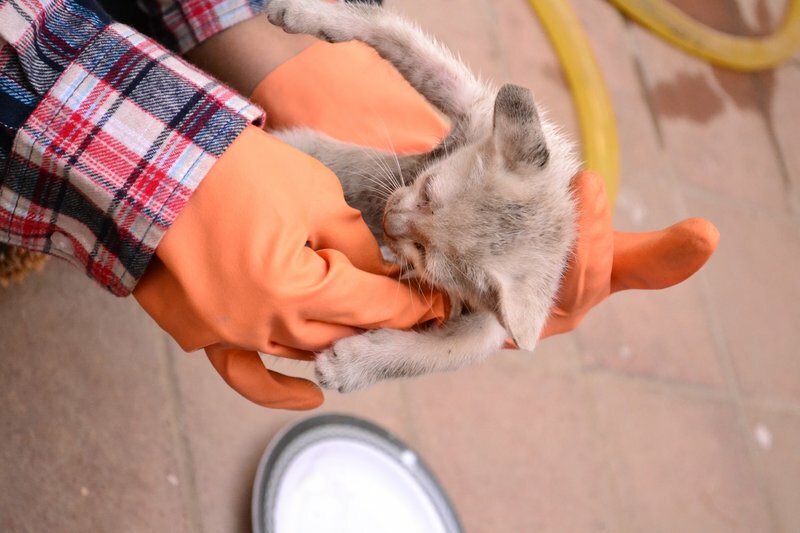 I scrubbed and cleaned, and neared the edge of tearful despair, contemplating driving him to a faraway location and abandoning him, or giving him away. Obviously, I couldn’t be so cruel. But I was decidedly not as loving as I should be towards a pet, and remember smacking him on the head a few times until I did some research and learned that’s not a very good way of teaching a cat not to do bad things. 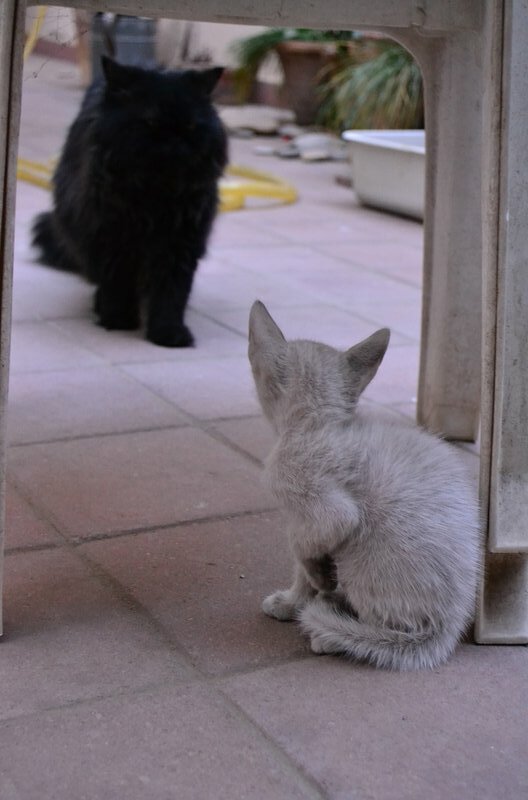 I consulted my upstairs neighbour, who lives with six cats, and asked for his advice after tactfully inquiring about any peculiar behaviour he may have encountered in his brood of kitties. He told me about a fabulous product that de-odourises pet ‘accidents’. You just spray it on and let it break down the molecules in cat piss that cause the odour! Apparently, cat pee contains a high concentration of urea, about twice as much as dogs, and that’s what gives it such a strong smell. They can’t help it, poor things. They’re just evolved that way. 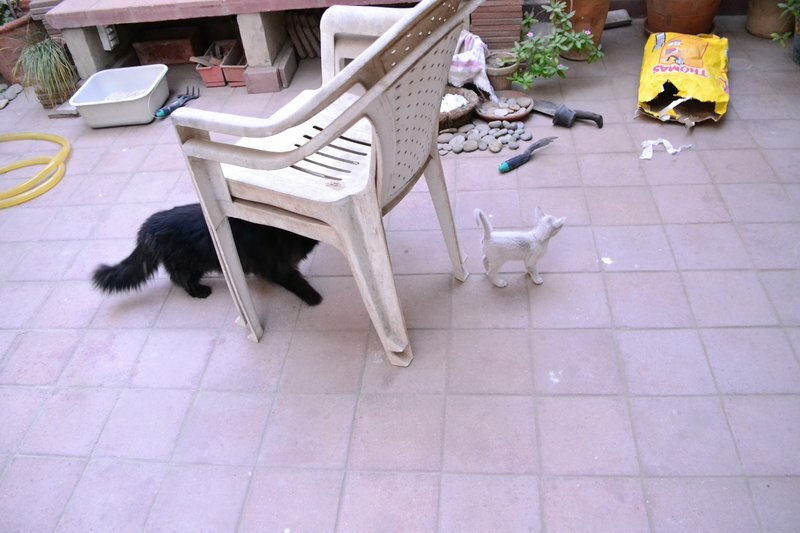 It’s useful for marking their territory, and keeping unwanted enemy cats at bay. That’s what we thought was wrong with Fuzzy. We thought he was unusually insecure about the stray cats that prowled around our building, yowling their heads off and busily marking their own territory outside our doors. Of course he could smell their pee. So he went into counterattack mode. Either that, or he was trying to attract some romantic interest his own way…. We marched him off to the vet to have him….(gulp!)….neutered. 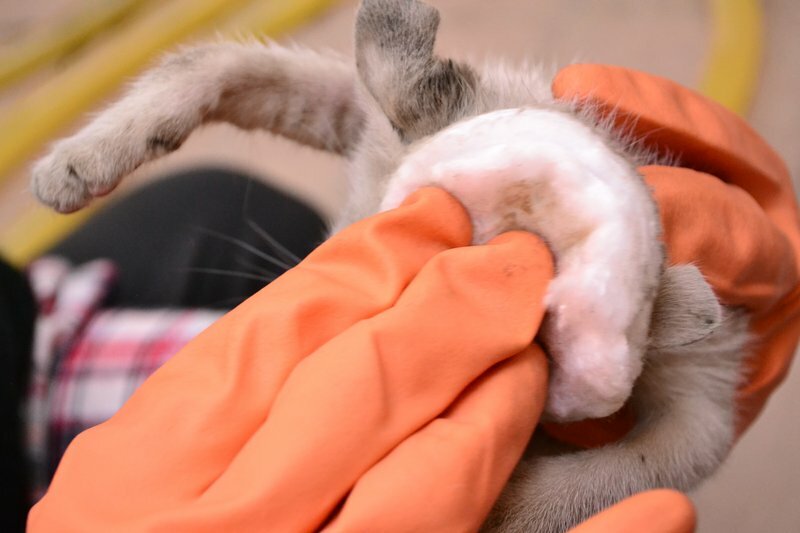 Now, neutering is supposed to be a fairly simple procedure in male cats that have normally built external genitalia. 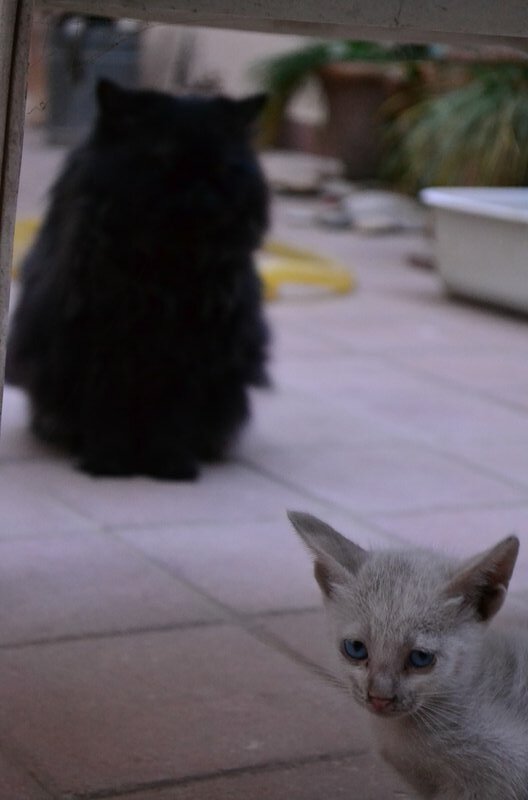 But our cat chose to be different. The vet felt him up and declared him to have a condition called monorchidism. In other words, he only had one descended testicle! The other one was somewhere in his abdomen, developing at a much slower rate than its twin. Nevertheless, poor Fuzzy had to undergo not just the scalpel, but an utter invasion of his privacy, and needless to say it was a difficult time both for us and him. It has been four years learning how to live with our cat. He’s been through vaccinations, de-fleaing, de-worming, operations, antibiotics, and many trips to the vet for checkups. You must be wondering if the neutering made a difference. Well, it didn’t. Ultimately, we just had to be very vigilant, make sure his litter tray stayed clean enough for him not to turn up his aristocratic little snub nose at it. We roll up our rugs and protect our sofas with plastic coverings every night, and every morning we unroll the rugs and put away the plastic. 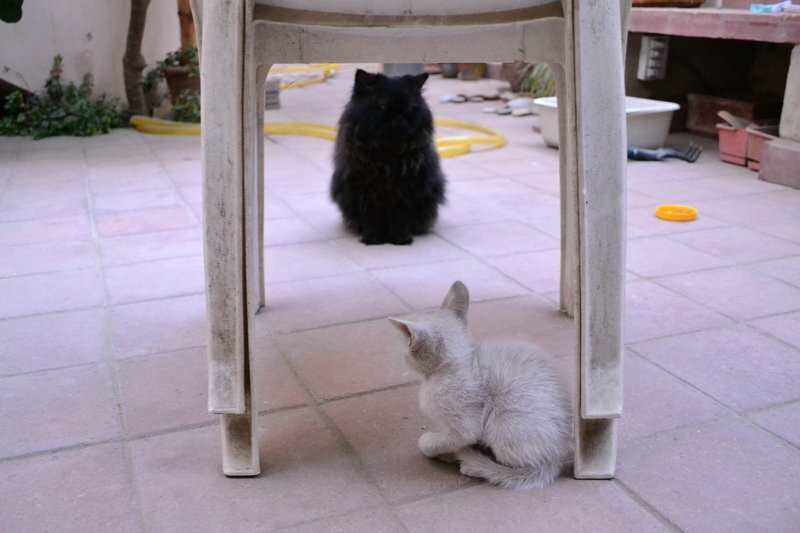 We chase Fuzzy to his litter every time he starts sniffing around and acts suspicious. Sometimes he pees on the plastic coverings, so I am to be seen mopping and de-odourising every so often. But at least it isn’t so difficult now that we have accepted this gruelling labour as part of our lives. As you can imagine, Princess Amu doesn’t lift a finger. In her defense, the poor girl has to go to school, so she is forgiven. So you can imagine, dear readers, the joy I feel when I notice, or hear, Fuzzy using his litter tray of his own volition. It’s a daily triumph to see him do that. Okay then, my writing for the day done. Time to go unroll those rugs…. how does one stay mad at a cat that looks at you like this?